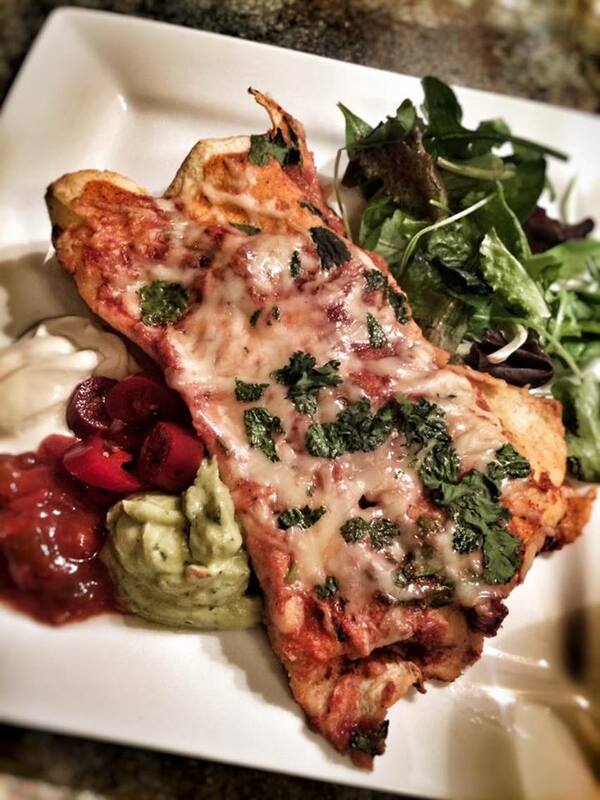 Fajitas are one of my favourite quick and easy meals so naturally I also love an enchilada. Most enchilada recipes you find are stuffed only with chicken and cheese (and sometimes refried beans) so to reduce points and up the fillingness of these enchiladas, I’ve packed them with veg too. The end result is a lovely mess of warm oozy chicken, vegetables, wraps and cheese – the perfect feel good dinner. My recipe below serves four people. This way you get two enchiladas per person. My OH was rather worried when I told him he was only having two (and that two portions were being kept for the next day) however he was very surprised at how filling they were, especially with a nice crunchy salad. If your OH is a particularly big eater you could even add some rice or butternut squash chips to the dish but the enchiladas with salad were defiantly enough for me. 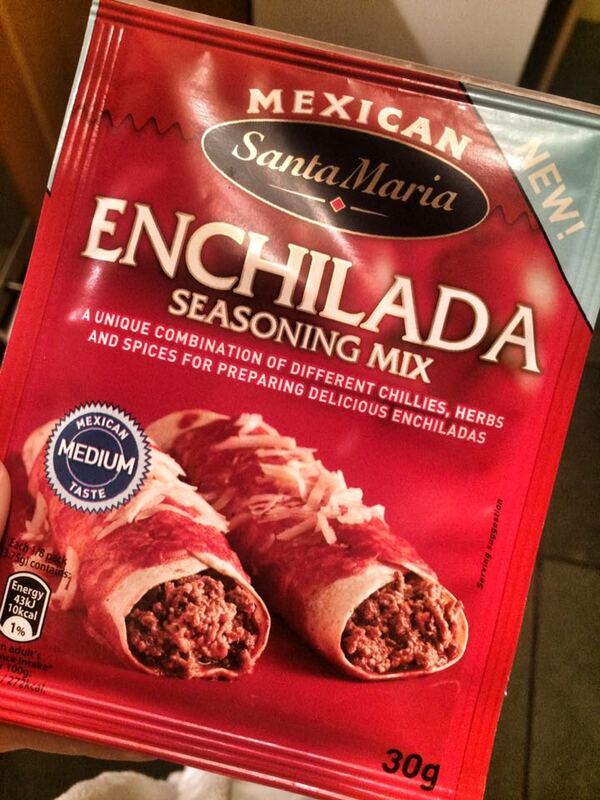 Because I had it in the cupboard, I used a Discovery Enchilada Spice Mix from Tesco. This gave a lovely flavour to the sauce but I did have to add a few crushed chillies. If you can’t find the spice mix, you can add the following spices to the passata to get that lovely tangy taste: 1 tsp smoked paprika, cumin and oregano and ½ tsp chilli powder, garlic powder, salt and crushed chillies. You could also add a little chipotle paste if you fancy. Spray a large frying pan with 1kal and fry seasoned chicken for 6-8 minutes until cooked through. Remove from the pan and then stir fry seasoned peppers, onions and mushrooms for 4-5 minutes until soft. Add chicken back to the pan and stir to combine. In a separate saucepan or bowl, pour the passata, seasoning mix (or spices) and half of the cheese. Stir and then pour half of this sauce over the chicken/vegetable mixture. Stir so evenly combined, add a little water if you want more saucy, add the coriander and spinach, stir and simmer on a low heat for a few minutes. Now you can begin assembly. This is easiest to do if you have all of the ingredients arranged into a small productions line style operation. Begin by taking a large baking dish, spray with 1kal. Pop the wraps in the microwave for 30 seconds and then begin to fill each tortilla with the meat/vegetable mixture, evenly sharing between all 8 tortillas. Roll each enchilada and place seam side down into the baking dish. Once you have filled all 8 tortillas, pour over the remaining sauce mixture and top with the rest of the cheese. Pop in the oven for 15-20 minutes until the cheese is nice and bubbly. Serve with a nice green side salad and a dollop of half fat sour cream/guacamole/salsa if you fancy (careful to add the extra points). where can I but weight watchers tortilla wraps? I usually get mine in Morrisons but I think you can get them in most big supermarkets ! OH MY GOD!! Just made these and they were DELICIOUS!! Thank you so much for your great recipes! I thought I’d need more than 2 wraps but portion size was perfect! That’s what my other half thought too but it’s enough isn’t it 🙂 so pleased you enjoyed ! This recipe is just fabulous! 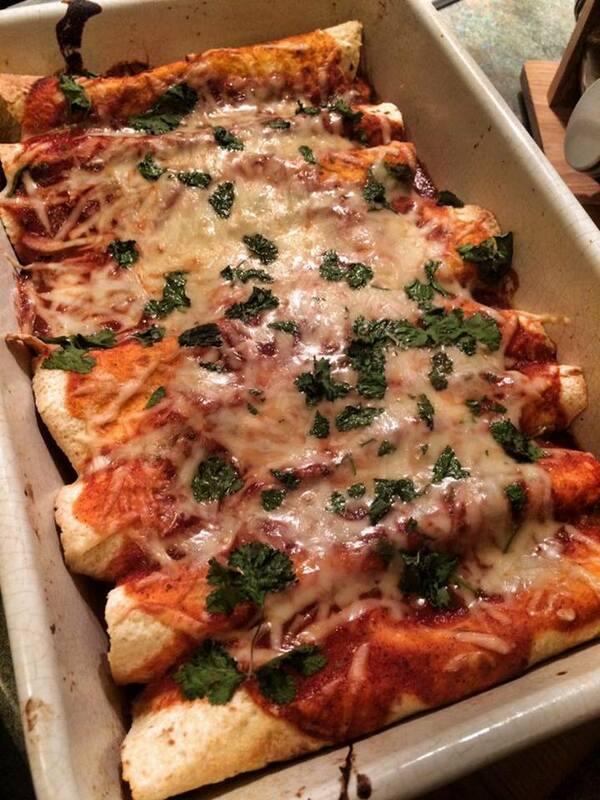 Pre WW enchiladas were a firm favourite in our house but on WW the points of my normal recipe were just too much. What a relief when I found that this one was not only easy to fit into my daily points but even more delicious than what I used to make! Thanks so much Laura! Can’t wait to try this!! My mouth is literally watering!!! Finally got round to making this tonight… It was delish!M 😝 Very filling & lovely with a simple salad. Even OH said “This doesn’t taste like a ‘skinny’ recipe”!! & that’s someone who uses lots of oil & butter! Thanks Laura! I cooked these last night and both myself and my husband loved them. I have cooked many of your recipes and they have all been lovely and thank you so much for this blog its brilliant. Can I just ask how you work out this recipe is 9sp? I worked it out as the wraps are 4 each so that’s 8 for the wraps alone and then you have the cheese and chicken to add which surely would be 1sp each at least? I am sure you are right and I am wrong !